Bravura directorial debuts are great, but sometimes it takes a couple tries to get things right. Case in point: Young Ones, the second feature film of writer-director Jake Paltrow. The episodic TV helmer’s first feature effort was 2007’s romantic comedy The Good Night, which disappeared with barely a plunk, never seeing a theatrical release wider than two screens despite a cast that included Penelope Cruz, Martin Freeman, Danny DeVito and the director’s Oscar-winning older sister, Gwyneth Paltrow. Wisp thin and beset with tonal incongruities that were never quite convincingly smoothed over, the movie felt too much the work of someone with no other specific aim than to please. Befitting the general maturation one might expect from a period of seven years, but also exhibiting a (ahem) conscious uncoupling from the preconceptions and expectations of others, Young Ones is a more ambitious, assured and accomplished work in every respect. A kind of low fidelity, futuristic, dust bowl character study that flirts with the dystopian and science fiction genres before locating the pulse of a good old-fashioned story of simple human retribution, Paltrow’s film is involving and original, even as it wears traces of its influences. 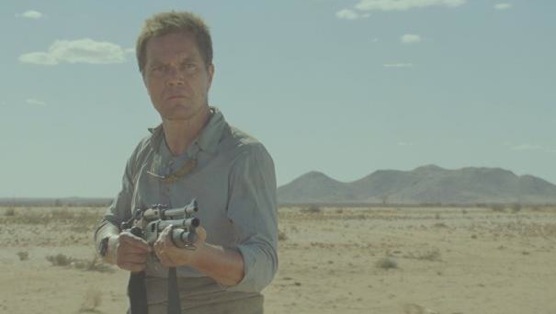 The movie unfolds in a remote rural hellscape at an unspecified date in the near future, when the scarcity of water has turned countries, states and even smaller communities against one another. At its center is Ernest Holm (Michael Shannon), a reformed alcoholic who lives with his two children, Jerome (Kodi Smit-McPhee) and Mary (Elle Fanning), and works as a deliveryman shepherding supplies to an isolated work crew building an irrigation system. At first Ernest seems a single father, but it turns out that Jerome and Mary’s mother, Katherine (Aimee Mullins), is hospitalized with a spinal injury that may well be a result of Ernest’s erstwhile carelessness. After he has to put his work mule down, Ernest outbids Flem Lever (Nicholas Hoult) for a used robotic donkey at auction, setting in motion a chain of events that will alter both the Holms’ head-of-household dynamic as well as the water fortunes of the community at the core of Young Ones. Paltrow assigns the movie chapters that hint at an interwoven chronological complexity that never quite materializes; it’s more accurate to simply say that his film passes off the baton of focus between its main three male characters—Ernest, Flem and Jerome. There is a representational quality to Young Ones, and a lot of its pleasures are unapologetically aesthetic. It has revelations and smart turns, but if one becomes too invested in the notion of radical plotting, they will be disappointed. Instead, it’s best to think of the film, broadly, as a reimagined, minor-chord riff on some of the same thematic preoccupations present in There Will Be Blood and The Treasure of the Sierra Madre, as filtered through a 1970s sci-fi lens. Young Ones benefits from a spare but stylish production design and visual scheme that would slot it comfortably as a double feature alongside Duncan Jones’ Moon. It’s clear in both films that there are finite resources, but they also both possess imaginative workarounds and an incredible amount of smart thought put into the devices seen on screen. Cinematographer Giles Nuttgens utilizes the oppressive natural landscapes of Young Ones’s Northern Cape, South Africa location shoot, while production designer Sharon Lomofsky, art director Brian Glaser and costume designer Diana Cilliers jointly create an immersive and beguiling world that draws a viewer in. Composer Nathan Johnson also delivers superlative, interesting work that pays homage to spaghetti westerns and other genres without ever coming across as reductive; character leitmotifs give the film a sense of scale and significance. Young Ones isn’t perfect; its rendering of women is empty bordering on irresponsible, and it also doesn’t fully root down into the nature of Flem’s semi-estranged relationship with his father Sam (an excellent David Butler), or the genesis of Mary’s obsession with him, in a way that would further anchor its incremental increase of doom. But the acting elevates the material. Shannon can play roles like Ernest pretty much in his sleep if he chooses—not that he’s disengaged at all here—and the young actors, Smit-McPhee and Hoult, each show something in Young Ones that they haven’t yet before, which is a credit to Paltrow. A dusty, Old Testament tone poem of obsession, savagery and other darker human impulses, Young Ones grapples with the long shadows that sins of the past can cast, and the question as to whether they can be escaped. Entertainment journalist Brent Simon is a member and former three-term president of the Los Angeles Film Critics Association. You can follow him on Twitter and on his blog.